Meet the Edwards Family of Dallas, Texas! Personal Chef and Internet Entrepreneur, Dapne Osunlade Edwards homeschools sons Ifayemi "the wisdom of God blesses me" 10 years old and Muntu "God-Man" 2 years old. What Brought You to Homeschooling? Before having children, Daphne had always imagined that she would homeschool thinking that, “culturally, academically and spiritually [homeschooling] would be the way to go.” But life has a way of challenging and surprising us and when first son Ifayemi was born, as a single parent Daphne felt that homeschooling would have to wait. When Ifayemi reached school age Daphne enrolled him in the local Montessori school. Later Daphne married and she and her husband agreed that homeschooling would be best for their family. It was an easy decision to bring Ifayemi home since even in the Montessori program Ifayemi was facing the usual challenges black boys often face in the school environment. 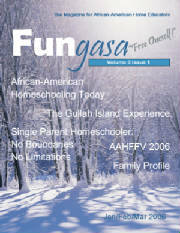 The family relocated to New York and Ifayemi became an official homeschooler during the second semester of first grade. Like many homeschoolers, Daphne read every book she could get her hands on about homeschooling. Ifayemi was thriving and the family was off to a great start. Then life threw them another curve and Daphne again found herself a single parent. But this time she was determined to keep homeschooling and make it work. Daphne and her sons have lived in Texas for about 3 years now and have found their place in the homeschooling community by building what they needed. While Texas is a homeschool friendly state with many established homeschooling co-ops and networks, Daphne felt there was clearly a void in resources for African Americans and a need for secular homeschool support. So, she built was needed and the Dallas-Fort Worth Blackboard yahoo group was born. “Created to have a sense of community for my boys while growing up and to be able to feel welcomed somewhere,” DFW Blackboard is primarily an email community meeting four times a year for group activities. 2. “Of course you don’t want to fail, but realize you don’t have to do everything. Be an administrator and pull from other people’s wisdom” Concerned about the development of her pre-teen son, Daphne made the decision to call male friends for ideas on rites of passage.